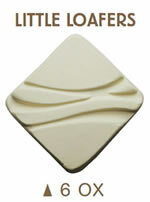 The first clay I tried in my cone six throwdown was Highwater Clay’s , a midrange adaptation of their immensely popular . Descriptions found on various distributors’ websites say it is “a very popular porcelain-like clay with the attitude of a stoneware. It is very smooth, a joy to throw, and takes glazes extremely well.” One can only assume that the same description applies to the Little Loafer’s. All that is stated in that description is “Little Loafer’s has the same fine properties of Loafer’s glory, but has been specifically designed for the lower cone 5-6 firing. It is simply fabulous.” Here’s my experience so far. When I opened the bag, I grabbed a small piece out to feel in my hand. I was struck by how very plastic it was. The clay is very smooth, and very soft. There is an almost gelatinous quality to it. With even a slight amount of water, it becomes slippery in the hand, even slimy, but leaves the hand clean. I’m guessing there is a fair amount of bentonite and/or Veegum T included in the recipe. They are absolutely correct in their claim that it is smooth. There is a very small particle size here. Upon a visual inspection, it appears whitish gray in color in it’s raw state. I can see small black flecks, nothing to be alarmed about, most likely some coal or other organic content associated with the ball clay that must be in the mix. Most likely that will burn out in the bisque firing. There seems to be very little grit associated with this clay. I’m not talking about grog, but rather the fine grit I usually feel in a porcelain, associated with the frit, feldspar and flint that make up more than half of a traditional cone 6 porcelaneous clay. It gets me wondering how this is is fluxed way down to cone 5-6. As it dries on my fingertips, I feel a soft, silky powder, which leads me to believe that the main flux in this clay is talc while Plastic Vitrox Clay is used in place of feldspar. I quickly wedge up a ball and sit down at my wheel. 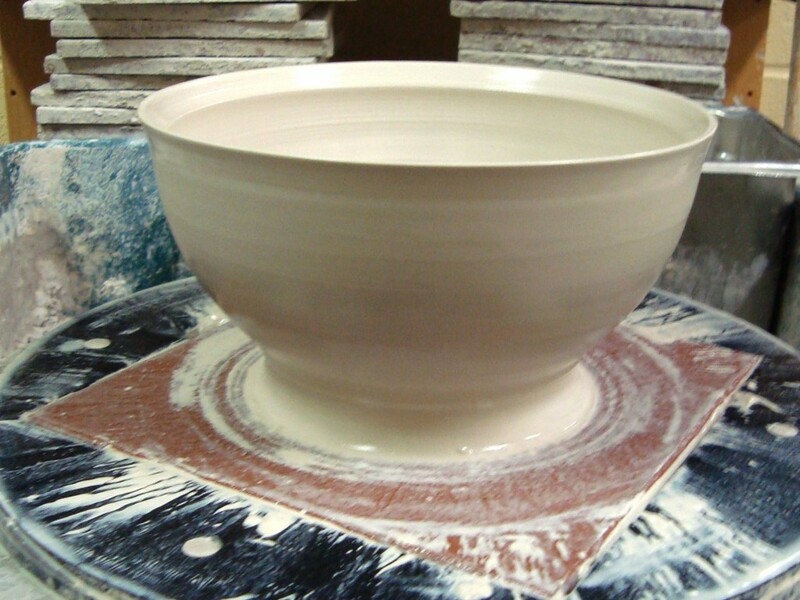 The first test for throwing will be a wide shallow bowl to see how well the clay holds up to gravity. I notice that the softness will be an issue in this test. I make a note to try this in a second round where I dry it out a bit before using. The slipperiness of it really feels nice while centering and opening. One application of water is enough for the whole process. I find that I need to spin the wheel a little slower than I am used to, as centrifugal force threatens to open it up. It has a tendency to go thin, and once it opens further than I want it to, It does not respond well to collaring it back in. In the final shaping, I have a very difficult time getting the shape I want, and it tends to slump a bit in the middle point. This could very likely have to do with the extreme softness. On that point, I will say that it is much better to ship out clay that is a bit too soft than a bit too dry, as it is more difficult to make the clay softer. It is a relatively easy thing to make the clay harder, all it takes is 45 minutes on a plaster slab and a quick wedging. So… I did go ahead and dry some to my ideal stiffness. It had some major improvements in standing up and collaring, but still had some difficulties. It really has a tendency to go thinner than I want it to. When a bit stiffer, it holds up quite nicely to the transfer off the wheel and onto a shelf, always a crucial factor with bowls. The next test is the tumbler. A tall drinking glass, this form should be thrown as thinly as possible. I like it to have no indication of throwing lines, as they tend to conflict with the slender vertical nature of the form. Furthermore, I like to have a very specific shape, all about subtlety, much harder to get than it looks. Little Loafer’s has no problem going thin. I notice in the throwing of this form that the clay seems to absorb water readily and as a result, tends to get a bit slumpy. Once again, I have a bit of difficulty getting the form to collar back in when it goes too far. It does work up a nice slip on the surface, which I like to leave on there. The softly undulating trail of slip left by the rib looks great under the glazes I use. 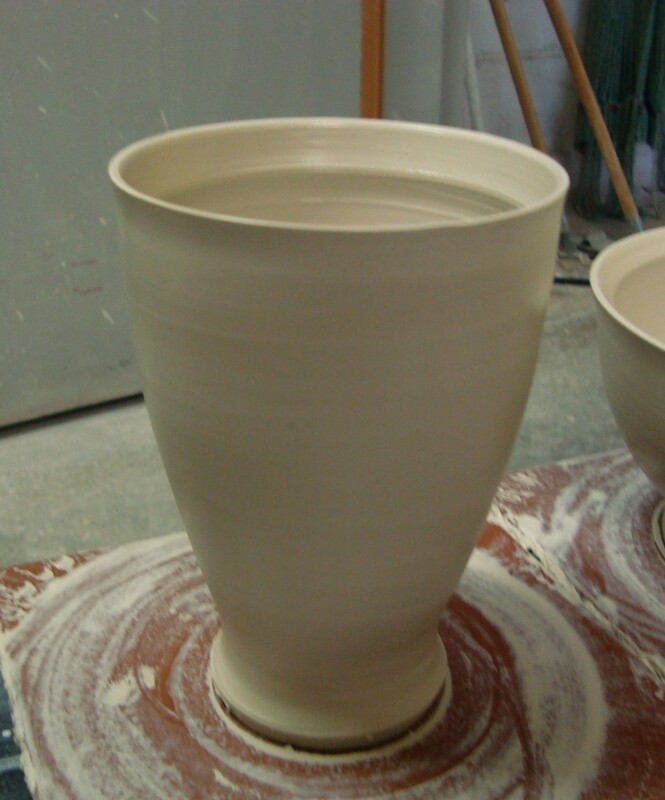 The throwing lines are very hard to remove with the rib, I give up at smoothing it when I feel like the clay would rather fall over than accomodate my wishes. I noticed that in all the forms that I threw today, there was a slight undulation up and down on the rim. Little Loafers responds differently to touch, possibly due to its lack of tooth(or stand-up-ability associated with varied particle size). Highwater Clay is accurate in their claim Little Loafers has the attitude of stoneware. This is truly nothing like throwing with porcelain. I think this is more geared towards someone who likes using stoneware but has found the need for a white firing, smooth clay. I actually found the experience to be more like throwing with a low-fire whiteware than like throwing with stoneware or porcelain. Not to say that’s bad, it would just take a porcelaneophile like myself a lot of getting used to, and might take away some of the sensual pleasure that is throwing with porcelain. All in all, I would say this is a nice clay to throw, very plastic, but could use some more tooth, and perhaps it could be a little less absorptive. It wouldn’t be the end of the world if I switched over to this, but it wouldn’t be an improvement when it comes to throwing. We’ll see how it fares in the rest of the tests. Phenomenal write up! I’m already quite familiar with the clay (both versions and the version they had before they made the split into two clays), your take was spot on, so I am really looking forward to reading your take other clays I’m not familiar with at all. Little loafers throws very well. It throws, in my opinion, a lot like loafers glory. We decided as a group that Little Loafers was not as pleasurable to throw than Loafer’s Glory and so discontinued buying it where I teach. We all seem to like P-5 porcelain – in fact I love throwing with it – but I find it blisters in the glaze firing sometimes. No, not glaze blisters but bloating blisters. Cone 6, oxidation. Go figure. Thanks for an excellent write up on this clay body. I have been pondering giving it a try and was looking for this sort of detail to help me in my decision.